With over 40 years of experience in the world of drainage, BAILEY's name is an internationally recognised sign of high quality in all the areas that matter. Strong and robust, each piece of equipment is tested to immensely high standards. Designed with little tweaks and twists to suit the most specific of jobs, proper flow and completed projects are only ever a heartbeat away. The wide array of rods is truly the backbone of the company. Designed to relieve pressure or even prevent blockages, there's a slender and masterfully crafted tool for any kind of problem. Strong and durable enough for even the worst of jobs, there's a reason why seasoned tradesmen always return to BAILEY time and time again. It's not just the poles themselves that stand out, it's the range of attachments that can be fitted. 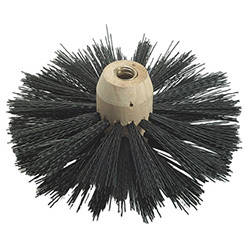 Scrapers, plungers, wheels, screws and brushes - there's a helpful add-on for each and every kind of unpleasant built up. Designed to be easy to fit, the little modifications can be applied within seconds, allowing the user to swiftly complete the task at hand. The market for drainage products is a busy one, but BAILEY haven't just survived for the last few decades - they've paved the way and constantly raised the bar. Have a question about our Bailey range? We‘ll be happy to help. Send us a message here.